He has a bunch of power and is an all around great player. 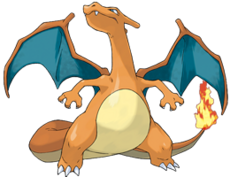 Charizard is one of the greatest pokemon of all time as McGuigan is one of the best players in the PWL. Snyder is the equivalent to an evolved pokemon. He is a scrappy, and fast player and is well known in the PWL as is Sandslash in the Pokemon world. Also, the spikes on his back are similar to Snyder's spiked hair. Jochim doesn't look very powerful, but he is an effective player in ways other than just power. 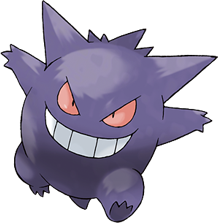 Gengar isn't big and strong, but he gets the job done like Jochim. Both are elite in their fields of work. Dufour is a raw power hitter who still is a rookie. Rhydon is a raw powerful pokemon in a non-evolved form. Maybe next year Ryan can be Rhydon. Also, Dufour's nickname is Rhino, which is the animal Rhyhorn is modeled after. We have yet to figure out Buscher's wiffleball strengths, just like Tangela has yet to be figured out by other pokemon. Both are not very powerful, but like to have fun. Tangela had yet to have an evolved-form until three generations later when he turns into Tangrowth. Buscher may be a late bloomer as well so stay tuned. Both are easily provoked and mysterious. Also, both are brave. 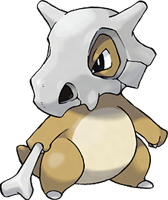 Cubone keeps a bone in his hand, and hits people with it when he gets angry. Gunderson, the Most Rage Award winner, keeps a bat in hand and throws it at opponents when he gets mad. Mr. Mime is a love him or hate him kind of pokemon. Honeywell is a love him or hate him type of player. Both are great at what they do but can rub people the wrong way. Any they are pretty much identical twins. Ellenbecker and Slowpoke are not the best at what they do. Ellenbecker is a subpar hitter, but has his shining moments. Slowpoke is a subpar pokemon, but is psychic so it makes him way cooler. Both are very well liked. Both are loyal, determined, cuddly and very popular with fans of there respective areas. Ian can put a charge into the ball while Pikachu can put a charge into his enemies. Qui Gon is skilled and wise as is Alex, but may be out done by future competitors (Darth Maul). Joe had sudden moments of rage early on like Obi Wan. But in the end they both became wise masters of their craft. Furry and loveable most of the time, but make him angry and he’ll rip your arms off. They both seemed to come out of nowhere and take over with vast ability. But I think Obi Wan (Joe) will be his eventual downfall. Appears to be a nice kid but can turn into the most destructive b*stard ever. I don’t know why, but I see a resemblance between the two. You wouldn’t guess by his stature, but he has some major skill. Appears to be long gone (or frozen in carbonite) but makes an unexpected come back. Skilled bounty hunter whose future is a mystery. Fits Eliott and Jango. Destined to follow the same path as his brother (or father). Appearing to have average career, but will eventually become a strong player (or jedi). Will become the center of all evil in the league (or galaxy). Both seem to be a good idea at the moment, but eventually we will all regret their existence.